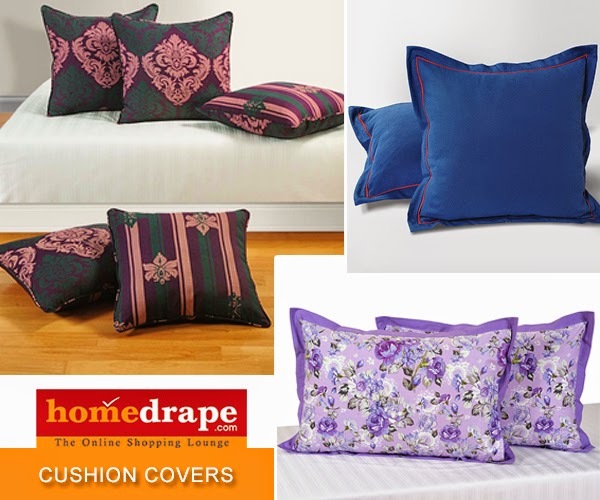 Home Drape Official Blog: How Cushions Make a Difference to any Décor? How Cushions Make a Difference to any Décor? Cushions are useful to add vivid colors, eliminating the lifeless aura and giving a new breath to space instantly. So, if you want a sudden quirky quotient to pop up in your abode, then they can certainly help you out. Whether you are running short of time or need a quite cheaper accessory for home makeover, cushions are going to help you out in many scenarios. Especially, those who consider redecorating a home as a big project would really find them as great rescuers. Matching your cushions completely with the texture of couch is completely a BIG NO. It’s a major disaster since cushions are meant to pop out furniture by adding some extra colors instead of blending with the existing theme. Colors you choose for cushions must have any resemblance with the other elements of décor like curtains, walls or carpets. Basically, whatsoever shade you use must blend with the interiors instead of working against each other. The number of cushions you are supposed to use depends upon the size of your sofa. For a three seater, around five cushions can work where as for a two seater only four would be enough. There is no need to say with one seater, stick to only one cushion. Mixing up size and shape of cushions is a great way of creating the drama. If you are good in mix and matching, then two to three colors can also be used together pulled out from your room itself. To see wonderful designs for cushion covers, browse our online portal at homedrape.com. Get Ready for a Lavish Dine Out! !